Shark is well-known for their robust immune systems and have a long history of use in traditional medicine as health-giving tonic. This product is 100% pure freeze-vacuum dried from 100% premium New Zealand deep sea shark that is cold pressed to retain the high quality of mucoplysaccharides and complex proteins. Each hard gel contains; Shark Cartilage Powder 750mg. Encapsulating aids. No artificial flavorings, preservatives, sugar, salt, corn, yeast, gluten added. No artificial colourants within capsules. This product contains a seafood ingredient, For pregnant or breast feeding women, heart disease or stroke sufferers those who have recently had surgery or about to have surgery. Please consult a health care professional before taking. Sorry about we not longer have Old Shark Cartilage 1200mg capsules. Old shark cartilage 1200 contains fresh shark cartilage 1000mg (400mg shark cartilage powder). 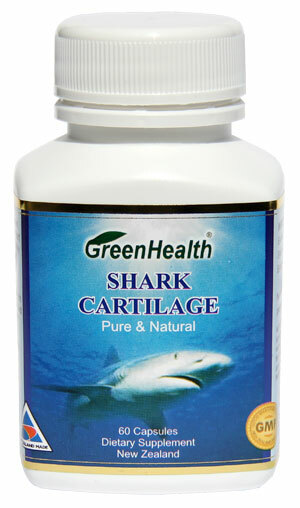 New shark cartilage contains 750mg shark cartilage powder as equiv fresh shark cartilage 1875mg. So new Shark Cartilage 750mg is much better product. Our shark cartilage is freeze-vacuum dried from 100% premium New Zealand deep sea shark that is cold pressed to retain the high quality of mucoplysaccharides and complex proteins. Some cheap shark cartilage on the market is from Asia, and they use heat dried to produce shark cartilage powder, all active ingredient lost after heat. Shark Cartilage, in the true sense of the term, is just that--cartilage tissue from a shark. Cartilage, a translucent elastic tissue, composes most of the skeleton of embryonic and very young vertebrates and, through a process of calcification, is transformed into bones which make up the fully developed skeletal system. Fibro cartilage, the first type, is found between the backbones. It is the strongest of the three types. The second, hyaline cartilage, is gristly elastic tissue that thinly covers the moving ends of bones, connects the ribs to the breastbone, and supports the nose, windpipe, and part of the voice box. This type of cartilage is likely to harden in elderly people. Yellow cartilage, the third variety, is the most elastic. It is found in the external ear, Eustachian tube, and throat. The bones of children are relatively pliable because they contain more cartilage--which is found at the tops of bones in zones called growth plates--and less calcium salts than do the bones of adults. (A theory has been postulated that newborn children are resistant to many diseases because of the large amount of cartilage present in their bodies during the early fetal and developmental stages.) Elderly people have much less soft tissue such as cartilage and a higher proportion of calcium salts, so their bones are more brittle. Amazingly, cartilage is a tissue that performs its functions without nerves, blood vessels, or a lymphatic system. Nutrients are, therefore, not transported to cartilage via the blood or lymphatic fluid. It is this particular characteristic that seems to hold particular promise in battling cancer and other diseases that cause the formation of malignant tumors. Shark cartilage has been successfully used in both animals and humans to reduce pain in arthritis and improve mobility. Shark cartilage contains one or more substances which inhibit the production of Angiogenin, a substance responsible for the formation of new blood vessels. Cancer tumours cannot grow beyond about 2mm in size without the formation of new blood vessels to support new tumour growth. Shark cartilage appears to be much more effective in preventing new blood vessel development than other cartilage sourced from mammals. Cancers release chemical messages which cause blood vessels to grow. Interruption of this process inhibits tumour growth. All shark cartilage is not the same! Processing techniques are critical to maintaining its therapeutic benefits. Handling of the raw material must avoid the destruction of the active principles of the cartilage.